Last week’s bug fix caused another bug. This time the ‘go left’ button wouldn’t if you were on the last card. Fixed again (hopefully). When the big card shows up, it’s purpose is so the opponent can see what’s being played. 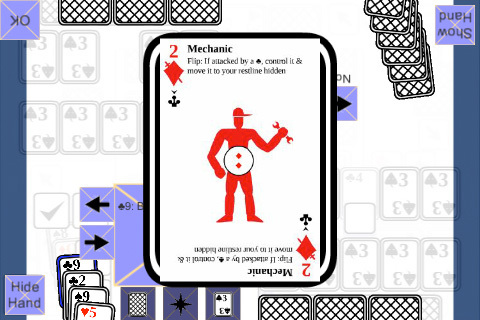 However, players were able to play cards during this time or end the turn. The screenshot shows this being fixed. Also, there’s a thing in the game where you can respond to a spell with another one. It wasn’t programmed yet since I thought it would over-complicate things but I decided to put it in because I thought it was important.